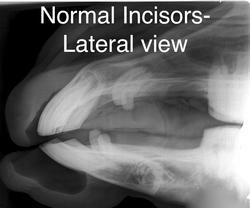 The following Photos and Radiographs are by Midwest Equine Services Advanced Dentistry. Midwest Equine Services Advance Dentistry is excelling in equine dentistry techniques. Located in Wisconsin, they have a mobile unit that travels throughout the Midwest. 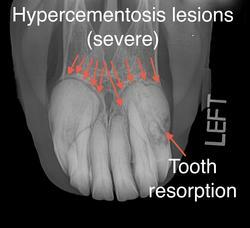 Equine Odontoclastic Tooth Resorption and Hypercementosis, also known as EOTRH, is a syndrome in horses that results in resorptive lesions of the incisors and sometimes canine teeth. It is usually gradual in onset, though often isn’t diagnosed until quite extensive lesions are present. Most commonly it is a condition of older horses (15+), though it has been seen in horses as young as 13. While this syndrome has probably existed for many years, it has only been in recent years that it has been properly identified and named. 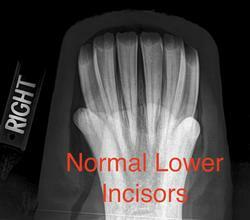 Diagnosis is typically made through radiographs of the incisors. This is the only way to know definitively how many teeth are affected, and how severe the lesions are. We currently do not know the underlying cause for the syndrome. Because of this, there is no known treatment at this time to help prevent this from happening. 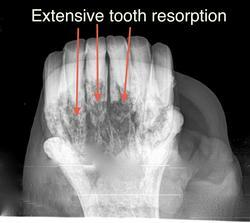 The treatment for affected teeth is extraction. 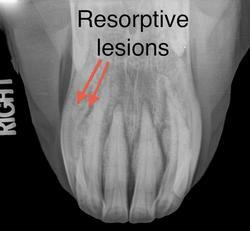 As the disease progresses, the roots of the incisors (and sometimes canines) start to resorb, or basically dissolve. 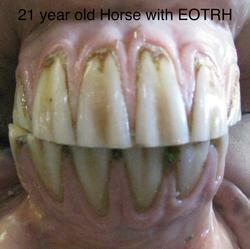 In response to this, some horses develop hypercementosis, which is an excessive buildup of cementum (calcified tissue) on the roots of one ore more teeth. This process can give the appearance of bulb-like swellings around around the roots of the affected teeth in response to try to stabilize these teeth. Unfortunately, as the disease progresses these teeth eventually start to loosen and become painful. 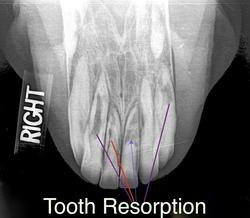 As further resorption occurs, some horses may even fracture off weakened teeth. Many of these teeth become infected as well, as the roots continue to degrade. This can sometimes present with small red “dots” visible above the gum line of the incisors, or even small pimple-like draining tracts in this same area. Many older horses are fairly stoic, and don’t always exhibit obvious outward signs of oral pain until the clinical disease is quite progressed. As severe changes occur, these horses can start to lose weight and go off feed. Some horses will also exhibit irritable behaviors when being bridled or ridden. The goal is to avoid this from happening. Horses that are diagnosed and treated earlier on will have more positive outcomes (avoid pain and loss of weight). 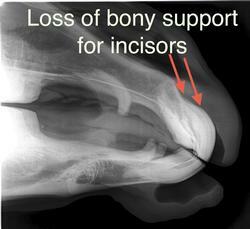 It is also interesting to note that many horses bounce back tenfold after extraction of these teeth, even those that end up having all of their incisors extracted at once. Where their owner didn’t realize there was a painful component to their disease, the horses become much more bright, happy, and personable after the extractions. Radiographs are essential to making a diagnosis, because most of this process occurs below the gumline and can not be seen without proper radiographic evaluation. 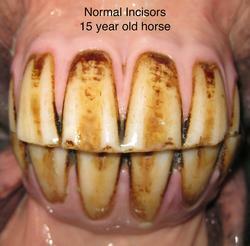 Extraction of incisors for this condition over the past several years has proven to be effective. What we have found is that extracting the most affected teeth first does seem to help slow down the progression of the resorption spreading to the other teeth. The theory is that by removing the source of inflammation, it allows the adjacent bone and neighboring teeth to “quiet” down, so to speak. The number of teeth that should be extracted is entirely related to the stage of disease when the diagnosis is made. If an early diagnosis is made, there may only be 1-4 teeth affected. 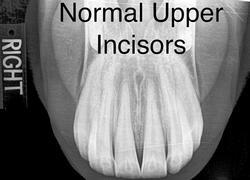 As the disease becomes more progressive, all of the upper and/or lower incisors may be affected. If all of these teeth are severely affected, there is no good clinical reason to leave any of them in place. The follow up care for horses that have incisors extracted typically includes antibiotics and a soft diet for several weeks. Most horses are back to happily eating by the next day. We usually recommend no riding with a bit for 2-4 weeks following the procedure. After that, they can resume all former activities. Can the horse graze again after extraction? It doesn’t take very long for them to figure out how to rip the grasses off with their lips. The incisors are actually not used for chewing or grinding the food, this is done by the cheek teeth. What will the cosmetic appearance be like? mouths following extractions, but this can be quite variable.